As far as sedans go, the Dodge Avenger has much to offer. 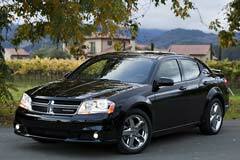 A Dodge Avenger is an incredibly spacious car and also offers a great deal of fuel economy. The 2.4L 4 cylinder engine with 4-speed automatic transmission averages 30 mpg on the highway and 21 mpg in the city. For those that enjoy a rather quiet ride on the highway, the engine is regarded as noiseless and handles quite smoothly. An anti-lock brake system is also installed in the Avenger, thus enhancing a safe journey. The interior has five seats and plenty of cabin and leg room. 1st and 2nd row curtain head airbags contribute to the safety of those in the vehicle. The consumer electronic gadgets in the vehicle are kept to a minimum, but a MP3 player and an AM/FM/Satellite Radio are available for listening enjoyment. The more recent used vehicles can be purchased at a reasonable price. 2011 Avenger 4dr Sedan Mainstreet 2011 Dodge Avenger, Blackberry Pearl with 54904 Miles available now! 2014 Dodge Avenger 2014 Dodge Avenger SELL/TRADE!